Very soon I hope to get my first look at the new South Terminal at Austin-Bergstrom International Airport, which opened its gates on April 13 with a flight by Allegiant. One of the notable feature of this terminal is the outdoor patio that passengers can visit after check-in. Along with shaded couches and chairs, food trucks will provide refreshments on a rotating basis. “It’s all about the Austin experience,” said Jeff Pearse, CEO of LoneStar Airport Holdings. ABIA has incorporated into its design. This terminal has a separate entrance from the Barbara Jordan Terminal, and shuttles will take travelers from one to the other as needed. The 30,000 square foot terminal was an Air Force base building before being renovated in this $12million project. to use the new South Terminal. “We’re very excited for our move to the brand new South Terminal in Austin,” said Lukas Johnson, Allegiant senior vice president of commercial. 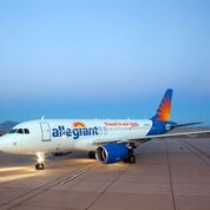 “This move to the South Terminal will allow Allegiant travelers in Austin to have a more accessible and convenient travel experience.” The company will also begin two new nonstop routes just in time for summer travel plans. 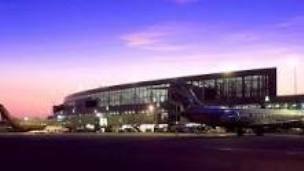 In addition to Allegiant moving to the new terminal, other carriers will have the opportunity to use the South Terminal to better service Austin travelers. Via Air plans to offer service from Austin to Missouri starting in June, and Sun Country will begin service later in the summer. The new terminal will have eight check-in counters, two self-service machines, baggage claim area, security checkpoint and three gate areas. It will feature ground-level boarding and an accessible pet area outside. Although my next trip is on one of America’s “legacy” airlines, I hope to get a look at the expansion and perhaps even see a difference in traffic in the established terminal.